Welcome to Tombstone, Arizona! Enjoy wearing one of these quality made baseball style caps with Tombstone or Tombstone, AZ embroidered on them. All of our caps are one size fits all and we have both adult and child size caps. These caps make an exceptional gift and are a great addition to any cap collection! Balls & Blood, Steers & Mud Baseball Cap. Black Cap with Brown Bill. 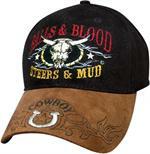 "Bulls & Blood", "Steers & Mud" embroidered with steer skull on cap body and Tombstone, AZ on side or back. One size fits all. 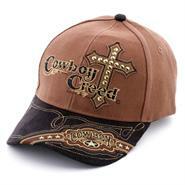 Cowboy Creed Ballcap has a stylized Cross and the words "Cowboy Creed. Brown and Tan Cap with Black Undervisor. Tombstone, AZ embroidered on side or back. One size fits all. I Like My Cowboys Dirty Baseball Cap. Black/Brown Cap with Black Bill. Rhinestone accents and embroidered bill. Tombstone, AZ embroidered on side or back. One size fits all. Designated Driver Ball Cap in White. Hilarious hat with dog "driving" horse and cowboy slumped behind dog in the saddle. One size fits all.